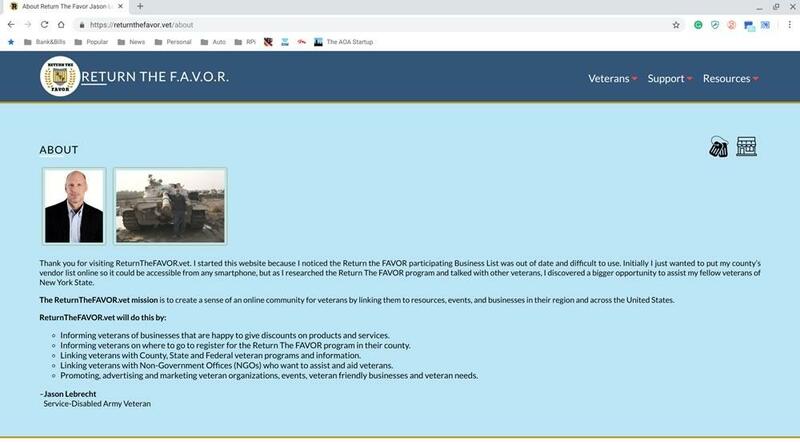 Project: Return The FAVOR, a website and phone application to allow veterans easy access to local discounts and veteran information anywhere around New York State. My name is Jason Lebrecht, I'm a Service-Disabled Veteran and MBA graduate student at RPI. I have started several businesses in the past, I 'm a former Army helicopter co-pilot, worked in Iraq for two years, and also worked for the US State Department. I found out by word-of-mouth that the Rensselaer County Clerk's Office had this program called Return The FAVOR for veterans to submit a copy of our DD-214 (discharge paperwork) for the record, in case we lost it or it became damaged. This document is vital for Veterans to show they served in the military to obtain home loans and medical treatment. If a Veteran loses this paperwork, it might take months for the Federal Government to reproduce another copy which could delay medical treatment or homeownership. As a thank you to Veteran, the County Clerk issues a Return The FAVOR ID card which is good for discounts in local shops and establishments. 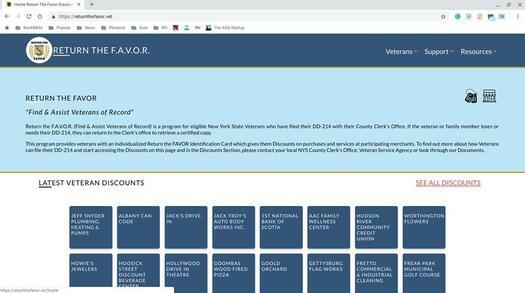 I want to take the Return the FAVOR initiative and make it a website and phone application where any Veteran can easily access local discounts and Veteran information anywhere around New York State. Return the FAVOR is currently implemented in 42 of New York's 62 counties and almost all of the programs are not kept up-to-date with business information, and none are mobile. This should get funding because it can be a resource for Veterans to connect with other support like Federal, State and Regional Veteran assistance programs, events and other services that are not currently being assembled. I have used my own financial resources to consolidate the Veteran-friendly businesses in the 42 counties of NYS from online PDF files and have partnered with AlbanyCanCode to create an MVP (Minimal Viable Product) website with the hope to sell this idea to the County Clerks of New York on consolidating their RTF information for the benefit of all NYS Veterans. The $2500 would be used to develop the ReturnTheFAVOR.vet website further and to integrate the businesses that have already signed up to give discounts for Veterans into the website. The funds would also be used for marketing the site to Veterans and to begin the process of onboarding other Veteran resources. 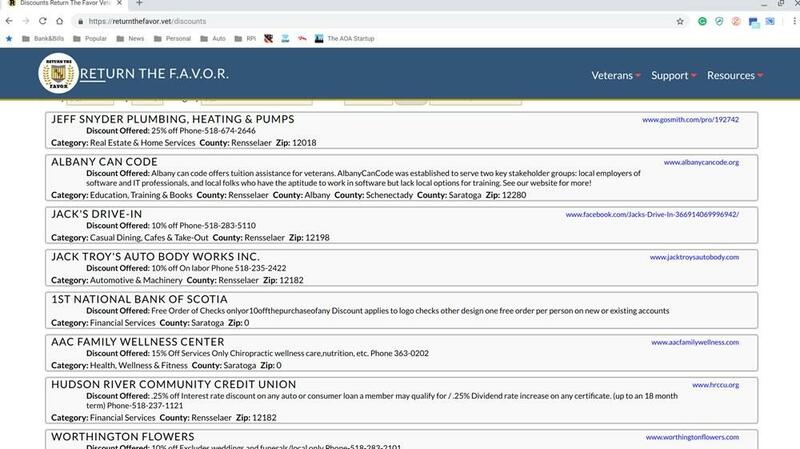 Currently, New York State Division of Military Affairs only links Veterans to Federal, State or County Veteran Service Offices but there are so many nonprofit programs for Veterans that don't get marketing or exposure to the Veterans they are trying to help. ReturnTheFavor.vet will bridge that gap between government and other services to create an online, mobile Veteran community and resource. Too often I speak with fellow Veterans about Educational Programs, Tax benefits, healthcare, and local events and activities for Veterans they didn't know about because information is usually word-of-mouth. ReturnTheFAVOR.Vet has the opportunity to change the information dissemination method with being a resource of information, available benefits, local events, and discounts.